Safety Reps @ 40: Still Vital to the Future of Safe and Healthy Work! and activists from other unions, sectors and jobs across the UK. Hazards 2018 addressed some of the most important issues facing workers providing practical skills, improving knowledge and giving delegates a new confidence to conduct their roles in the workplace. 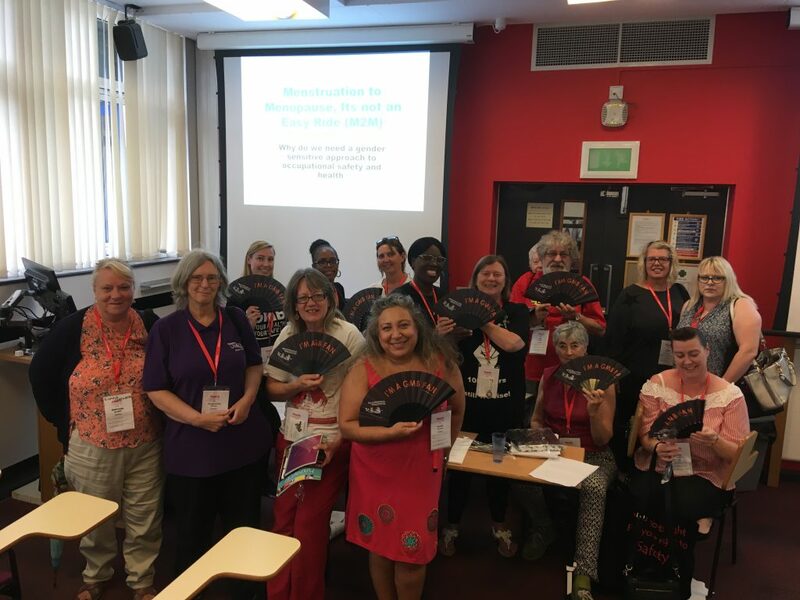 Find below a full report of the conference compiled by Janet Newsham and Hilda Palmer – it includes numerous links to course materials, presentations and resources. The Hazards Conference opened with a great session on the Friday evening, when more than 320 delegates from all over the UK, from different industrial sectors, different workplaces and different trade unions registered and attended the first plenary at this year’s Hazards Conference. Each delegate received a bag full of important and relevant information and the bag proudly proclaimed ‘You gotta fight for the right to safety!’ Included in the bag were the Hazards Campaign leaflets on supporting solidarity action with ‘Fast food workers’ and ‘Care workers’. Also a newly developed leaflet on SRSC Regs – a sort of mini brown book with information about key dates, links and contacts which reps can hang around their necks on lanyards and further copies can be ordered from GMHC – janet@gmhazards.org.uk or 0161 636 7558. The Hazards Campaign is developing a charter and the first draft of the charter was shared with delegates for further comment. Finally along with important information from campaign groups, trade unions, there was also the latest copy of Hazards Magazine. This is one of the most important publications for health and safety reps to keep up with the latest developments, news and topics. Finally, all delegates received a Hazards 2018 commemorative badge. The Friday plenary was chaired by Doug Russell USDAW National Health and Safety Officer; we were moved to tears by Louise Taggart whose brother sadly died as a result of being electrocuted at work. Louise is a founder member of Families Against Corporate Killing (FACK), an organisation set up in 2006 to fight for justice for all families and for safer workplaces for everyone. Louise’s brother Michael Adamson was killed at work in 2005 aged 26 years. She said she wanted to make his life count and to stop anyone else suffering the way her family had. Louise used the Hazards Campaign: The Whole Story and gave many examples of the deaths of people who are invisible in the HSE figures, because the HSE do not include them as workplace deaths in the records that they count. These include people who are killed in road traffic incidents, in air crashes, those killed at sea, those who die as a result of suicide which is workplace related. And the thousands who die as a result of illnesses because of their work or workplace. This was such a moving and powerful contribution and there were not many dry eyes in the hall at the end of her contribution. Our international speaker was Asli Odman from Istanbul Workers’ Health and Work Safety Assembly. 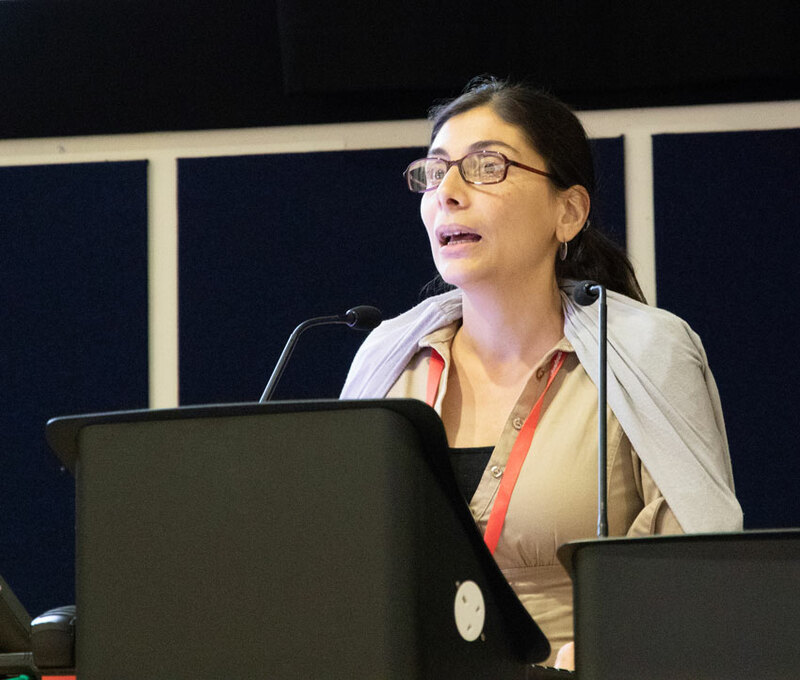 Because of the volatile political situation in Turkey, we were uncertain Asli would be able to leave Turkey to come to the UK to speak, so her contribution was even more valued and welcome. Asli spoke about the large numbers of workers dying at work and the work they are doing in Turkey to record deaths and investigate patterns and causes. She explained that there is a problem getting information from the Government and their organisation has to scan local and national press to find out about the work related deaths. They also actively support workers seeking justice. Everyday there are at least 20/30 deaths due to work related reasons which Asli described as being like a war in workplaces. They call their work related deaths ‘work related murders’! 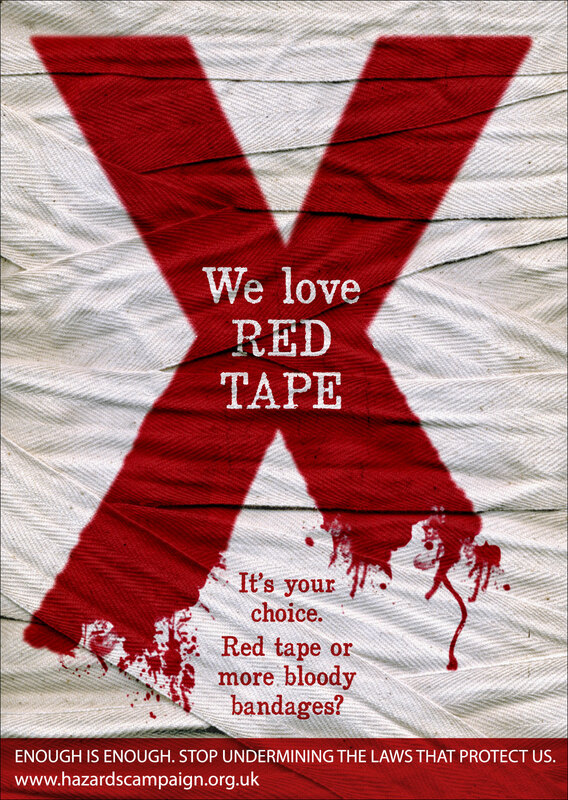 Last year 2006 people were murdered and this included 453 in the construction industry. She also explained that women are largely invisible in the figures because their work is often not registered as being done in a workplace and therefore injuries are not recorded. Asli said that one of the reasons for poor health and safety in the workplace is because of a decreasing number of trade union members. Membership of unions has dropped from 24% to 4% in the last 30 years. Annually they produce a book detailing the deaths of workers. Finally every month they hold a vigil to all those workers who have been killed. 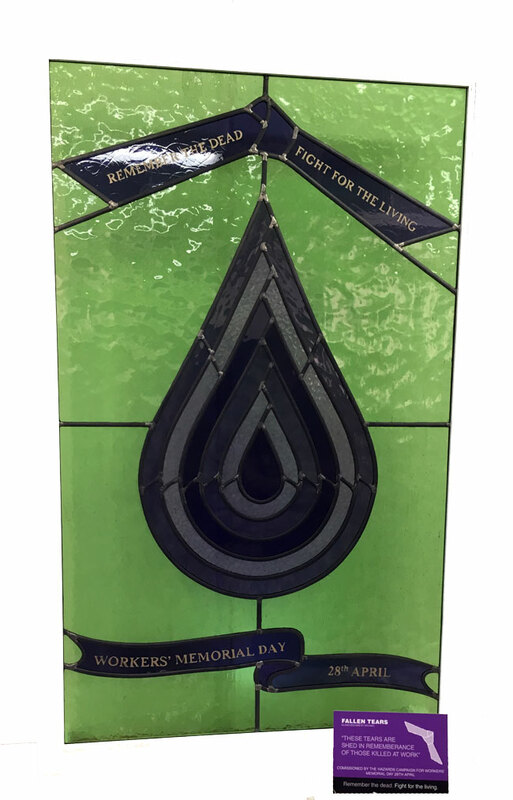 Asli explained that she has been inspired by Hazards Magazine, International Workers Memorial Day and Families Against Corporate Killing. Steve Tombs our final speaker on Friday evening spoke passionately about why Grenfell Tower tragedy is social murder. He said that Grenfell is a symbol of the consequences of deregulation, austerity, cuts and capitalism’s contempt. Steve spoke about the convictions which have already taken place because of Grenfell. There have been 7 and are nothing to do with the fire. He spoke about the gap between rich and poor. The people still waiting to be rehoused despite promises, the physical, emotional, psychological, cultural and financial harm being done to those affected by the fire. He spoke about the long term systematic attack on regulation which Governments must have known would consequentially result in death. It was foreseeable and that therefore this is social murder. 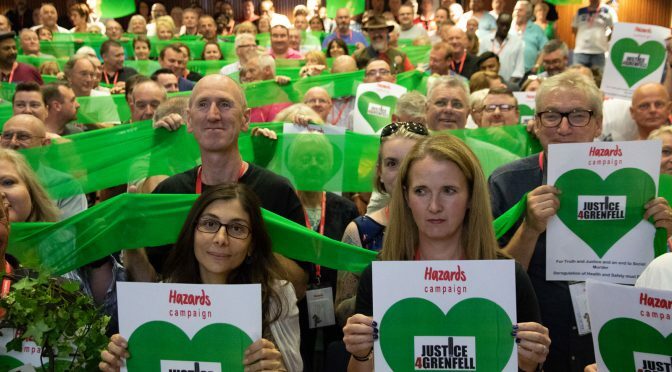 Delegates at the Hazards 2018 conference stood united in solidarity with all the victims of the Grenfell Tower tragedy fighting for justice and also with the Fire Brigades Union members being scrutinised unfairly in the public inquiry. We demand that those who are responsible for the deaths, injuries and continued trauma of families, friends, neighbours and firefighters are held accountable. 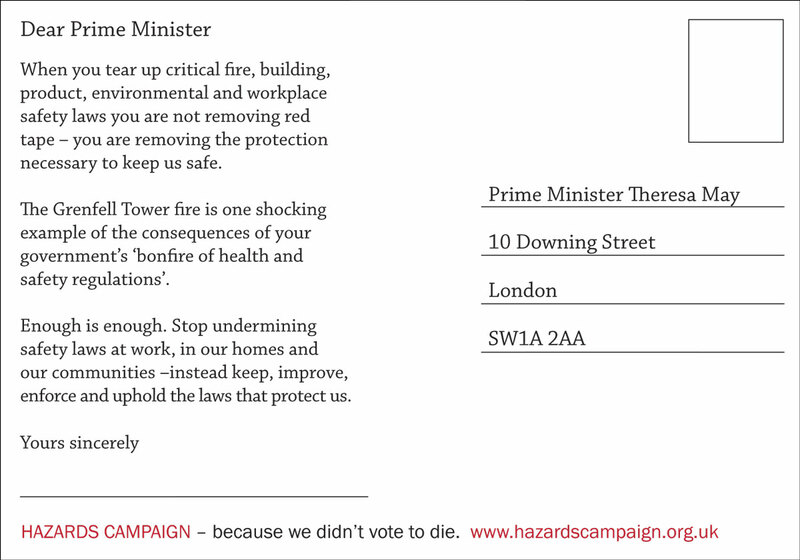 Those responsible for the deregulation of fire safety, the lack of enforcement of building regulations, those who treated residents of Grenfell Tower with total disregard for their safety and welfare and those whose inhumanity created the foreseen tragedy of the fire. 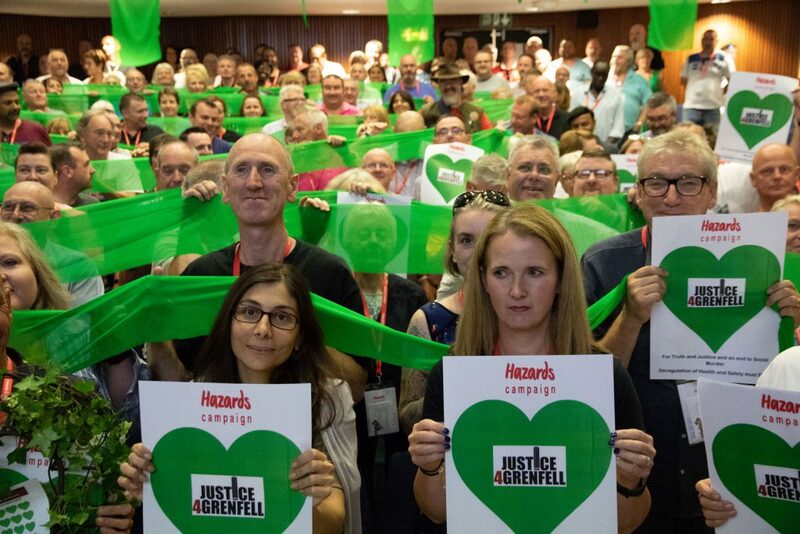 We demand justice for Grenfell! A day packed with workshops, meetings and campaign meetings with the evening free for network and discussion. The day began early with two workshops followed by a main meeting and then a campaign meeting. Meeting 1: From menstruation to menopause! Why do we need a gender sensitive approach to occupational safety and health. Meeting 2: How do we challenge the consequences of privatisation, commercialisation and marketisation of the deregulation agenda and the selective enforcement of health and safety laws? Meeting 3: Why is transparency in the supply chain necessary in advancing the health, safety and welfare of workers both nationally and internationally? Meeting 4: Is mental ill health a consequence of the intensification of working practices and bad management in our workplaces and what should we do about it? Campaign meeting 2: Why should Trade Unions use health and safety as an organising tool? Campaign meeting 5: How can the law support workers improve health and safety at work? Sunday was a ‘barn storming’ morning with inspirational, interesting and dynamic speakers. Although on the face of it, 5 is a lot of speakers – they were all great to listen to, they held our attention and the two hours passed as though it had been just minutes. Each speaker received a standing ovation and the audience was mesmerised and listened intently to each individual contribution, laughing where appropriate, indignant where there was cause and overall inspired by the lessons, leaving ready to challenge and improve the health and safety in their workplaces and provide solidarity to those in other unions and other workplaces. Sunday began with a presentation by Hilda Palmer to Ian Draper of the Hazards Campaign Silver badge in recognition of his work in the UK Stress Network and his work on behalf of the Hazards Campaign in the European Work Hazards Network. Ian then drew the raffle for the Leigh Day IPad. Janet Newsham introduced the session by saying that the conference was more than any other trade union conference and that she hoped everyone felt that they belonged to the health and safety family of the Hazards Campaign. A family with a common aim of keeping our friends and colleagues safe at work and with a network that extends beyond borders to sister organisations in places like Turkey, beyond sectors, industries, companies and organisations and brings everyone together to keep us all safe at work. Janet referred to the speech Hilda Palmer had made previously when she said health and safety was all about love and that no one should suffer the heartache that Louise Taggart had so movingly spoken about at the Friday plenary session. No one should suffer never seeing their loved ones again because of the negligence and total disregard of workers safety. And also the safety of our friends and families as they sleep in their homes, eat out or enjoy their short period of leisure. Kevin Rowan said that no one else does the role of health and safety reps. He said that if every rep carried out just one inspection a year that would be 100,000 inspections. The HSE carry out just 20,000 inspections. And of those they find 10,000 serious breaches! In a recent roadside inspection of lorries, 90% of the lorries inspected were not loaded correctly. Kevin said that Trade Unions have a legitimate voice and we need to champion our successes more. Audrey White showed a clip from a film that was made about her with Glenda Jackson playing her part. It was about the sexual harassment of 4 women shop assistants when she was a manager at Lady at Lord John in Liverpool and her subsequent dismissal for challenging him. Audrey’s story is inspiring; she went on strike supported by local T&G trade union members from the docks and road transport. She picketed the store and eventually after escalating the action won her case. Audrey spoke about why sexual harassment is a health and safety issue and the continuing need to challenge it. Ali Waqaar, a McDonalds McStriker spoke about the health and safety challenges for young workers and in particular the dire conditions that many fast food workers are facing in ‘warzone’ like conditions from overwhelming queues of people, violence, drunkenness, and the consequential burns, injuries and stress caused to the workers. He accused McDonalds of victimisation and the need for workers to join trade unions and challenge these unacceptable conditions. Ali described himself as a ‘warrior poet’ – he said working in McDonalds was like the current in the ocean – always moving, always asked to do something, lift something, orders flooding through. Dave Smith spoke about the importance of collective action. Dave writes a regular column, Organising 101, in Hazards Magazine which illustrates collective and creative action that could be taken to challenge unsafe and unhealthy working practices. He spoke about some of the challenges he had faced in the construction industry where in the 70’s one construction worker died every day and now 38 deaths a year from incidents and we can celebrate our role in that decline in deaths. He emphasised the need to continue to hold these companies to account. He said it was never about one person but always about the collective and that we are on the side of the angels. Ian Hodson gave a brilliant speech to end the conference. He spoke about the importance of not blaming migrant workers for deteriorating pay and conditions at work. He thanked the Hazards Campaign for keeping health and safety at the top of trade unions agendas when health and safety was being attacked, deregulated and undermined. Ian recognised the important role of health and safety reps and trade union activists and said that we will make a difference in our workplaces if we stand together and work collectively. A final thanks to all the staff at Keele for their support, patience and response to our many requests and challenges. A big thanks to all the GMHC staff for organising, administrating and delivering the conference. Thanks to all the volunteers who run the registration desk, help, support people with access needs and generally run to respond to delegates needs. Thanks to the workshop, meeting and campaign meeting speakers and tutors and for the plenary speakers who have inspired and challenged us all. Thanks to our photographers, and video recorders: Jawad, Nick and Cath. A special thanks to all the Trade Unions – nationally, regionally, at branch and workplace, Trade Union Councils, Hazards Centres, Solicitors and other campaigning organisations and individuals for supporting and sponsoring the conference. Finally, thanks to the hundreds of delegates for attending, contributing, networking and sharing their knowledge, challenges and successes with other delegates. Janet Newsham, Chair, How do we ensure that safety reps are still vital to the future of safe and Healthy work? Audrey White, Why Sexual Harassment is a health and safety issue!